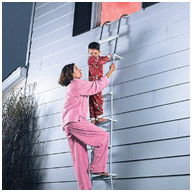 An important part of disaster preparedness for your family is to develop a home escape plan. This plan might seem odd since you obviously know the ins and outs of your home quite well, but in a disaster, every second counts. Something as simple as a small flame from an overturned candle can grow into a major fire in 30 seconds. Even a small gas leak from an overturned tractor-trailer can lead to a massive explosion leveling houses in a blocks radius. Because it’s impossible to predict when and where a disaster might occur, having a planned escape route from every room in the home is a best practice. If possible, having two different escape routes is best just in case one route becomes blocked. For rooms on a second story or higher, the only option to escape may be through a window. Having a collapsible ladder is a great investment to prevent injury should you have to “jump” for your life. 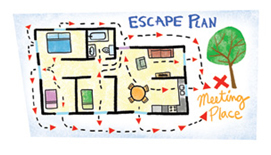 Practicing your escape plan is a great family exercise and can be turned into a game with children to help them remember. These exercises should be conducted monthly, addressing personal actions based on possible scenarios that could require your family escape or shelter-in-place (i.e. fire, tornado, hazardous materials spill, flood or even a loss of power). During practice drills, check windows and doors to make sure they open and close properly and that screens or security bars can be opened with little to no difficulty. For example in a house fire smoke might be too thick and oxygen is more plentiful near the floor since smoke rises, so your scenario should play out “feeling” your way out of your home. Time is of the essence when escaping; take the quickest and safest route to exit your home. Be sure to establish a designated meeting place for you and your family to ensure everyone has gotten out safely. Once you are out, notify 911. Be sure to report any missing family member(s) to a 911 Operator or a first responder immediately so they can attempt a rescue. Encourage any small children that may become separated from their parent during an escape to follow the plan.